Ken’s NY Deli & Brick Oven Pizzeria! 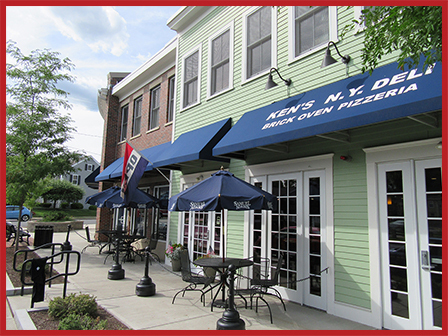 Come and dine at Ken’s NY Deli & Brick Oven Pizzeria where we serve everything fresh from the finest ingredients. Enjoy brick oven pizza, deli sandwiches, steaks, pasta dishes, salads, subs, wraps, and many all-time favorites. At our family-owned-and-operated restaurant you feel that unmistakable one-of-the-family vibe the moment you walk through our doors. Try the classic Reuben sandwich, our homemade Turkey Club, the old reliable Corned Beef Brisket, or our Chicken Salad. Sample our flavorful soups and chowders, too. For something new, check out our nightly dinner specials. We also have a full bar with beer on tap. Ken’s NY Deli & Brick Oven Pizzeria also offers party catering services. Get in touch with us for inquiries about our catering menu.